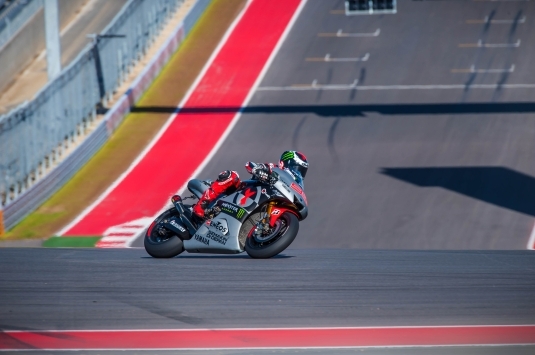 Yamaha’s MotoGP riders Jorge Lorenzo and Valentino Rossi have both made positive comments about the new Circuit of the Americas in Austin, Texas at which they began a three-day private test today. The circuit was recently opened and hosted a formula one race for the first time in 2012, MotoGP are scheduled to race at the track for the second round of the season on 21st April. Honda’s two factory riders Dani Pedrosa and Marc Marquez are also at the track, as is factory-supported Honda man Stefan Bradl. The Attack CRT bike that will wildcard in the American rounds is also being tested by Blake Young. Lorenzo, who posted a time of 2:07.388 in his day learning the track said: “I think it’s very important to come here and learn the track. I haven’t learnt 100% of it, I need more laps to learn my lines, but for the moment it’s a very beautiful track which is very complete with every kind of corner. In the beginning it was difficult to understand the lines but I have improved 22 seconds from the first lap today, that means it’s a hard track to learn and a difficult track to go to the maximum on. I think it helps more than some other places to have this extra time. I think three or four practices before the race will not be enough to understand it so some of the riders who didn’t come here will have a little disadvantage. Rossi who used the two Sepang tests to get back to grips with the Yamaha R1 also enjoyed the circuit: “I really like the track, my first impression is that it is beautiful. It’s very flowing with a lot of fast corners and a lot of change of direction; it is fun on the bike! There are three hairpins that are very tight; this is better for Formula 1 overtaking, but for us they are a bit slow. In general the track is good. There is some downhill and uphill and first braking zone is very good. We have to understand which tyre to use, but the asphalt surface doesn’t have any rubber on it at the moment so there is not so much grip at the moment. The uphill at turn one helps to stop the bike, which is beautiful. For me turn two is the best though and after you enter into the chicane which is very similar to Silverstone. The straight is very long, which is maybe good for overtaking. Times are below. The test continues tomorrow and Thursday.